What is Castle of Cagliostro? I heard that there was a real Count Cagliostro. Is it true? Wasn't there an arcade game based on Cagliostro? What is "Farewell Beloved Lupin"? What cars were used in Cagliostro? What weapons were used in Cagliostro? Lupin III is a very popular animation series in Japan, based on the manga by Monkey Punch. It has three TV series, five movies, and numerous TV movies. Miyazaki co-directed the first Lupin TV series with Takahata in 1971 (from episode #7 to #23). In 1979, Miyazaki wrote and directed the second Lupin movie, Lupin III: The Castle of Cagliostro. In 1980, under the pen name of "Telecom" (Telecom is the company which Miyazaki worked for then), he wrote and directed two episodes of the second Lupin TV series: #145, "Albatross - Wings of Death" and #155 (the last episode of the series), "Farewell Beloved Lupin". Lupin III is the grandson of the famous French Gentleman Thief, Arsene Lupin, created by Maurice LeBlanc. He and his friends, the master gunman Jigen and the master swordsman Goemon, go through many adventures to get treasures around the world. The beautiful and mysterious Fujiko could be either an ally or an enemy to Lupin. And Inspector Zenigata is always in hot pursuit of Lupin. Streamline renamed him "Wolf" in their dub of Cagliostro, and Nippon TV renamed him "Cliff Hanger". What is "Castle of Cagliostro"? Rupan Sansei: Kariosutoro no Shiro (Lupin III: Castle of Cagliostro) is considered by many as the best Lupin movie, and it is a masterpiece. A unconfirmed rumor has it that Steven Spielberg was completely blown away by this film. It's a classic adventure story with great action scenes, a princess in a tower (who is a lot tougher than your ordinary princess, though), a really evil villain, and a castle with trap doors, a dungeon, a maze, and many secrets. It's a fun, yet touching film. Cagliostro had been voted as "the best anime in history" by the readers of Animage magazine until Nausicaä came out. The heroine, Clarisse, had also been "the favorite heroine", before she relinquished that title to Nausicaä. The English dub of Cagliostro was originally available from Streamline Pictures, though Manga Entertainment has now re-released the movie on both VHS and DVD in both English-subbed and -dubbed formats. Manga re-dubbed the movie for this release. Yes, there was a real Cagliostro. He was a scoundrel in the 18th century who called himself a Count and counterfeited money. There is a book, published in 1924 in the first Lupin series by Maurice LeBlanc, called Countess Cagliostro. In this story, there appears a mysterious woman who turns out to be the granddaughter of this Cagliostro. The heroine of this book is Clarisse (!) and she marries Lupin (!!). There is also a sequel, The Revenge of Cagliostro. The idea of a "treasure under water" in Castle of Cagliostro was also taken from one of LeBlanc's Lupin novels, The Green-eyed Lady. Yes. There was a laserdisc-based arcade game called Cliffhanger back in the early 80s. It used footage from Cagliostro and another Lupin movie, Mystery of Mamo. 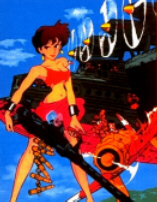 A Playstation game based on Cagliostro was released in January 1997. "Shi no Tsubasa Arubatorosu" (Albatross, the Wings of Death) is an episode in the second Lupin TV series. Miyazaki wrote and directed it in 1980. The Albatross looks like Giganto in Future Boy Conan, and the air battle scenes are very similar to the one between Giganto and Falco in Conan. This motif was later developed in battle scenes in Nausicaä and Porco Rosso. "Albatross" shows Miyazaki's love for aviation well. Albatross is a giant plane modeled after the Dornier Do. X. Seaplane and the Spruce Goose. It was housed in an airplane museum, and we can see many old planes there (some of them are from the Italian Air Force). It also contains a somewhat heavy theme: antinuclear. Albatross is a flying plant for ultra-small nuclear bombs. "Saraba Itoshiki Lupin yo" (Farewell, Beloved Lupin), aired in 1980, is the last episode of the second Lupin TV series. Miyazaki wrote and directed it, and since this was the last Lupin he was involved with, this was also Miyazaki's farewell to Lupin. And what a farewell Lupin (and we) got! "Farewell" is sort-of another Cagliostro. The heroine, Maki, is a dead-ringer for Clarisse (and played by the same voice actor, Sumi SHIMAMOTO). The last scene was exactly like that in Cagliostro, only this one takes place in Japan. However, the theme of this episode is a bit more serious than the Cagliostro theme. Lupin helps Maki to outsmart a greedy defense contractor who sells deadly robots used as weapons. There are scenes in which Tokyo becomes a war zone under martial law (a motif Miyazaki once depicted in Flying Ghost Ship), and we can see Miyazaki's feeling towards the military-industrial complex in this episode. Both "Albatross" and "Farewell" (Streamline named this episode "Aloha Lupin" in their dubbed version) were released by Streamline Pictures as Lupin's Greatest Capers. However, since Streamline has gone out of business, we don't know how long they will be available, or if another company will pick them up (hopefully Manga Entertainment will). English Scripts for "Albatross" and "Farewell". According to Atsushi FUKUMOTO, Lupin's car is a Fiat 500. A Fiat 500 was owned by Yasuo OHTSUKA, the head animator of the Lupin series. Miyazaki once wrote an essay about Ohtsuka and his Fiat 500 for Ohtsuka's book Sakuga Asemamire (Tokuma Shoten Animage Bunko, 1982, ISBN 4-19-669504-3). Clarisse was driving a Citroen 2CV, which was Miyazaki's first car. He once wrote a 7-pages manga about it for a car magazine NAVI ("Kakero 2-bariki, Kaze yori Hayaku", December 1989 issue). Shadow guards at the wedding: M-40 "Schmeisser"